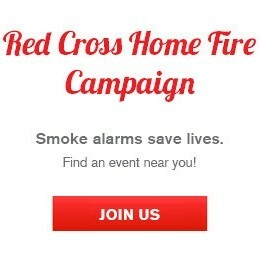 One hundred seventy-five volunteers from the American Red Cross, Orange County Fire Authority (OCFA), the city of Santa Ana, and other community partners installed 1,166 free smoke alarms for residents in Santa Ana’s Central City neighborhood Saturday, Nov. 5. The Home Fire Campaign, administered by Prepare SoCal aims to reduce death and injury by 25 percent. In its first two years, the program has helped save more than 110 lives across the country. Volunteers included members of American Red Cross Desert to the Sea Region, Orange County Fire Authority, the City of Santa Ana, Santa Ana CERT (Community Emergency Response Team), OCFA Fire Academy Classes 40, 41, and 42, Santa Ana Community College, Second Baptist Church, local high school groups, and OCFA Fire Academy Explorers. Linda E. Voss, chief executive officer American Red Cross Desert to the Sea Region addresses volunteers during the Santa Ana Home Fire Campaign Nov. 5. According to OCFA, the most smoke alarms installed in a single day was 774 in San Juan Capistrano’s La Zanja neighborhood on Feb. 21, 2015. The largest single-day smoke alarm installation in Santa Ana was 531 in the Pico Lowell neighborhood on Sept. 19, 2015. Santa Ana’s FMC Lugar de Gracia y Amor Church graciously offered their space as the rally point for the day’s activities. The volunteers were split into 45 teams. Each 4 to 5 person team included an installer, an educator, a documenter, and a safety observer. Most teams had a Spanish-speaking team member who served as an interpreter. After signing in, the volunteers were given training to help them complete their task. Training for the installers was administered by Mike Alba, OCFA, and training for the educators and documenters was administered by Amy Estey, regional preparedness manager, American Red Cross Desert to the Sea Region. The Kidde smoke alarms, provided by the manufacturer, feature a 10-year lithium, non-replaceable battery with alarm memory and “smart hush control”. The volunteers from team 40 (much like everyone at the event) had many reasons for volunteering and most of the answers echoed team 40’s installer Jerome Williams. “It’s important to give back to the community,” said Williams. Because of their friendly, outgoing personalities, Sonja and Miroslaba made initial contact with the residents and explained the smoke alarm event. Their demonstrated knowledge allowed the Home Fire Campaign team to quickly establish a rapport with the residents. This accelerated the installations while the education and the documentation took place. The residents were asked if they had a home escape plan. If they didn’t, Chris offered to help them fill one out. The resident was also asked if they ever had a home fire drill, and we explained that every family should practice fire drills at least twice a year. The residents wer shown how to test the alarm, and they were reminded that even alarms with 10-year batteries, need to be tested once a month and cleaned once a year by vacuuming or dusting.